Fitting low on the ankle, these Levis 120SF Cushioned Sole Low Cut Socks are best teamed with trainers or other low-sided exercise shoes that expose the ankle and calf for total air circulation and a breathable, barely-there cushioned fit. Made from a soft, combed cotton rich yarn, these are designed as heavy duty socks with a high impact softening sole for long days and rough surfaces. 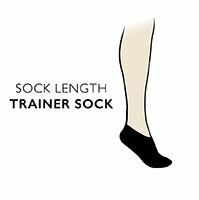 Made on a 120 needle machine, these practical socks have classic rib construction tops and cushioning running from toe to heel, with a non-cushioned upper for breathability.